Published by George Baxter in 1852 (Baxter’s Number 108). Also known as The Nativity. 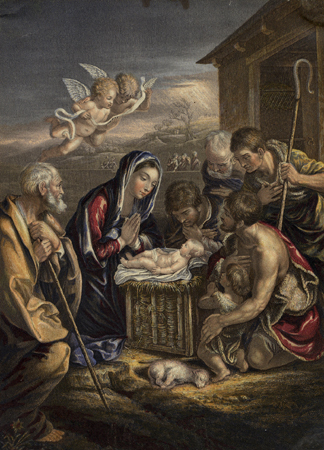 The Virgin Mother is seen kneeling in adoration, the Infant Saviour is in a wicker cot, a lamb is on the ground and shepherds and cherubs watch on. The print was produced from a key plate and fourteen blocks, some of which were zinc. This print was later included in the Baxter, Vincent Brooks, Vincent Brooks, Day & Son, and Le Blond republication lists. Baxter Process Print, size 6 x 4 1/4 ins. This print is unsigned and was originally priced at 1s. 6d. The print was also used as an illustration to “The Adoration,” a music score by W. H. Callcott. When on music the print is dome shaped with a gold border. George Baxter's religious subjects were popular with the public, reflecting the strong religious views at that time.